While we’re waiting for the Nexus 4 to go back on sale today, there is some good news as Google has started sending out Android 4.2.1 adding December back to the Nexus 4, 7 and 10 devices. There’s been a lot made about the Android 4.2 release as one of the buggier Android releases in recent memory and the loss of December in the contacts app is a big bug. Thankfully, the 4.2.1 update adds back the month of December, fixes Bluetooth stuttering and hopefully enhances some of the other minor bugs that have annoyed early adopters of the new Nexus line of devices. The update is just 1.1MB is size, so don’t expect miracle fixes aside from the major issues we’ve already discussed, but at least Google found a way to get December back on to these devices. The 4.2.1 update should arrive over-the-air during the next couple of days and we’d love to hear how happy you are to have December back in the mix. Christmas is back on! Would love for this to fix the fact that my phone vibrates for every email message even though my gmail settings say never vibrate. I know it’s an issue people are having so lets hope Android has taken care of it. There are sperate set of settings inside the gmail app. Check those first. That’s what I’m talking about, In my gmail settings, in the app it says vibrate never. I googled the problem and a lot of people are who have 4.2 are reporting the issue. The phone isn’t recognizing the app settings only the global settings. So if my phone is on vibrate the email notification vibrates. If it’s on complete silent it doesn’t. Not a HUGE issue but just something I would like to get taken care of. As a geek this is what I love about Nexus, lean, fast and always at the bleeding edge regarding software and updates! I’m with you, I’ve always wanted a Nexus device before, I’m happy with my N4. The one bug on the N7 that is still there is the screen flickering in auto brightness. I see 4.2.2 in the future… Seems like everything else was fixed. Is this a known issue? That doesn’t sound like a bug but a hardware issue. Call Nexus support. Truly enjoying my Nexus 4! Fantastic device and its battery life is actually pretty decent. (sidenote after the JB update my GS3’s Stellar battery life went to decent as well, they’re about the same now) I also ordered the bumper and surprisingly its of terrific quality, honestly didn’t think I’d actually use it but I am. Now just waiting for a full on vertical slip case I’ve ordered to arrive on Thursday before I actually take it outside of the house lol been switching my sim between that and the GS3 since I got the N4 on the 20th. Fantastic feel in the hand and the Adreno 320 really screams, 17,708 in Antutu whereas my GS3 had gotten 7,373 a 10,400 point difference! Samsung Galaxy users need an update for SMS group messaging…we would love to “reply to all”!! Glad the bug has been fixed — but while December was missing from the month “scroll wheel,” it was never really unavailable. You could still access it by using the keyboard (clicking on the month wheel and typing “D”). I noticed that my Bluetooth device didn’t connect as quickly since I updated to 4.2, but that was a good thing for me. Oh well, the last few days were a welcome change that will come to an end. But am I the only one thats had a few reboots? Like almost once a day… Thats alot right? Its doesn’t bother me because its quick unlike the sensation I had. December wasn’t missing from the main Calendar, but it was missing from the scroll wheel when setting a contact’s birthday or other form-filling locations in the core applications. You could still get it by clicking on the month and typing Dec, though. I see now lol. thanks. My update for for Galaxy Nexus was only 9 hundred-something kb. So… the 4.2 update is only for those with a Nexus device and those of us with Galaxy devices (such as the GS3, which I have), won’t be getting it??? 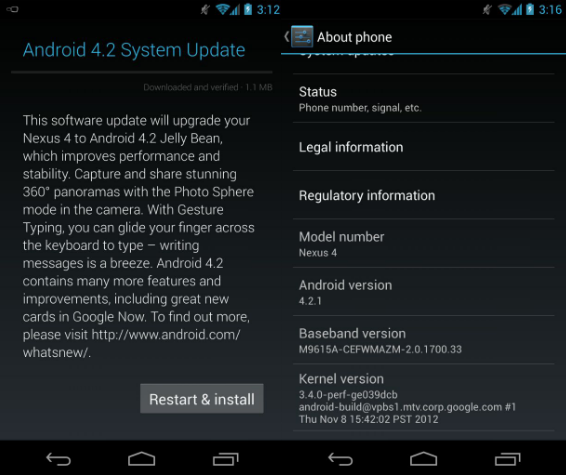 Nobody said you wouldn’t be getting it, but you don’t have Android 4.2 to be in a position to need the 4.2.1 update. Haha good point! Didn’t think about that :-P Thanks for replying, David – I visit the site daily and I think it’s awesome that you took the time to give me an answer so, THANKS! Another huge perk of owning any of the latest Nexus devices (including the GNex)…although I’m sure by the time 4.2 comes to the SG3, it’ll be without the December-less issue, but by that time we’all be on 4.3 or something, but you can always have the option to root. I got the update and all seems to be going well. Any improvement is a welcomed one. When will the stock browser revert back to auto-hiding the URL??? Hold off on upgrading or purchasing the Nexus 7 if you plan to connect anything to it via Bluetooth. Apparently the latest Android upgrade (4.2.1) has a bug that makes Bluetooth inoperable for at least some people. I could, but not longer can, connect my keyboard, phone and earpiece. Google technical support can only say they are aware of the problem and working on it. Yea what about the bluetooth 4 BLE and BLE DM bugs? Does it fix those too ? ?